These cleaning instructions assume the hardwood dance flooring had a factory finish or a finish added after installation. Unfinished wood dance floors are susceptible to water damage. Periodic screening or sanding and refinishing hardwood dance floors will probably be necessary every 18 months to 2 years. Dry mop before classes with an untreated mop. Check that the temperature in the room is between 65°-85° F and humidity is at 50%. Variations in temperature and humidity can impact wood dance floors causing gapping, cupping and warping. Use a detergent degreaser such as ProClean to mop the dance floor. Do not flood mop and do not rinse. Dye and scuff marks can be removed with a safe solvent such as Wipe Out Plus. For larger spills like coffee, tea or soda use Simply Gone. Follow the directions on the label or view our maintenance guide for more information. There are two recommended ways to clean up this mess. Put an artificial chamois cloth on the bottom of broom and dry mop the hardwood dance floor. The metal shards/dust will stick to the chamois. Rinse and reuse. Another way to pick up the residue is with a wet/dry vac. Coat the wood dance floor with water and immediately vacuum up the residue. For slippery wood floors try ProClean NS as your basic detergent/degreaser. It contains an ingredient that will create more friction. For immediate non-slip results use Slip NoMor which lasts up to a week. Every six months it’s recommended to deep clean your dance floor using a floor cleaning machine (125 rpm to 225 rpm) with a green (cleaning) or red (scrubbing) pad. ProClean Ultra is recommended. Follow the directions on the bottle or view our maintenance guide for additional instructions. Using a disinfectant is an important part of hardwood dance floor maintenance. Approximately 4 times a year or as needed, use ProClean D Plus which kills bacteria and viruses. Follow instructions on the label or read more about disinfecting your wood dance floor with Proclean D Plus in our maintenance guide. From time to time check the finish on the dance floor. If it has worn away you will need to refinish. Make sure the finish you use is appropriate for dance. We recommend FloorShield Kit which includes all necessary components to finish or refinish. You may opt for a professional refinisher. Confirm they are using a matte, non-slip product. 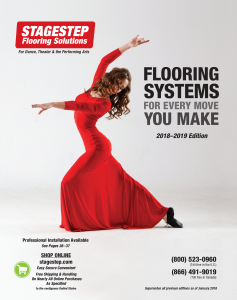 If you have any questions about how to properly clean a hardwood dance floor, contact Stagestep at 800.523.0960 for all your floor maintenance needs.